The Republicans in the state are really trying to make political hay over Gov. Schweitzer's veto of firefighter tax breaks now that fire season is really on us. This is blatantly politics and anybody with half a brain would realize this. Why didn't the Republicans make such a big issue out of it when the veto occurred? Why did they wait until there were several large fires burning in the state and then bring this up? Politics is the reason pure and simple. Hell, the tax breaks they are talking about only affects volunteer firefighters which doesn't affect most of the people fighting the big fires in the state. The Republicans are just trying to link these items up in peoples mind. The sad thing is that it will work in too many instances. Talking about tax breaks though, why firefighters? Why are they the only ones that were targeted for this tax break? Aren't there other deserving people out there? Policemen, Nurses, farmers, ranchers, hell just about everyone else for that matter. Why just the one class of people? That is what I would like to know. Why can't all the residents of Montana get a tax break? Maybe that is what the Republicans should be focusing on instead of the hay they are trying to make. That is too logical though and would benefit too many people. Easier just to criticize those in charge. There has to be a better way of doing things. They've got to be idiots. The Republicans refused the Governor's budget which realistically budgeted for fires at a much higher figure than what they actually approved. So now departments are begging and borrowing, and an emergency funding will happen without scrutiny from the legislature. They acted like fools, denying what was to be and has been inevitable - fires. 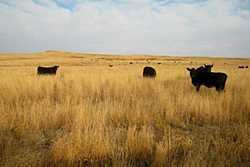 The calves grazing on the Crested Wheat Grass hillside. This is a real sandy, south facing hillside so the new green grass has really come in under the old grass and they are really enjoying it and doing good on it. Taken 10/29/2007.